1. Installation environment of shower bracket The water outlet of the hot and cold water pipe is 1/2 inch universal diameter, preferably R1/2 taper threaded joint, left hot water, right cold water; the distance between the joint center is about 15 cm, the height of the joint from the ground is recommended to be 60 cm. a. Install two shower pedestals. Shower hangs suggest a height of 1.2 meters from the ground and another 1.8 meters. b. First put the decorative cup into the thread of the shower bracket. After wrapping the raw material belt, screw the left and right shower brackets into the joints of the hot and cold water pipes. 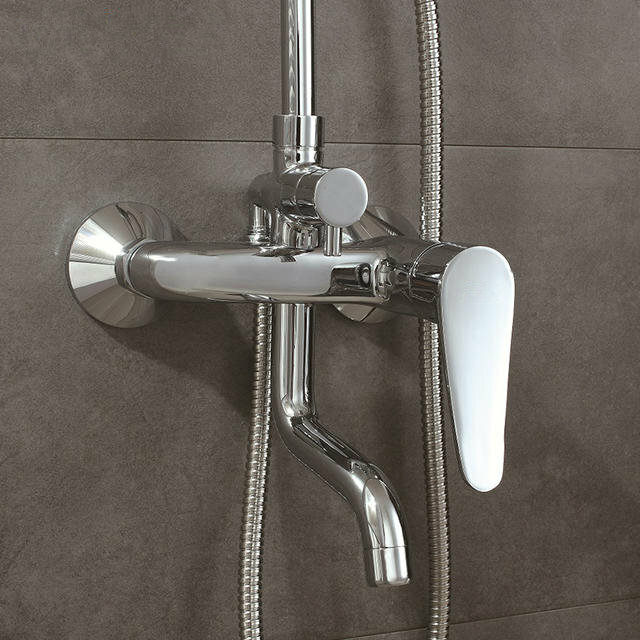 c. Adjust the distance between the front and rear of the left and right shower brackets to be 9 cm, and the height is consistent, which is consistent with the distance from the wall. d. Place the water stop gasket into the water inlet hole at the back of the faucet body, and then attach the shower faucet to the shower bracket. e. Install the water nozzle. f. Install the shower tube and shower head.